As predicted, a sizeable Cold Penetration into the U.S.! Short-lived, there will be more SEVERE COLD to come! POLAR VORTEX AND SOLAR VORTEX—2016-2017—!!!!! LOOK OUT – U.S.A. – CANADA, Here Comes the FREEZING ARCTIC COLD! As of December 05, 2016, the Arctic Air is now being pushed back by a strong rising Jet Stream. This means the COLD is back on, crosses into the US starting Tuesday. Not all of the US will be hit by Severe Cold Temperatures, but mid-north will, then running East. Frigid weather will last from a few days, to weeks. Ontario, Canada will be COLD! Wind ALERT. Color Blue and Aqua are Zones of Snow, Freezing Rain, Ice. Wind and Cold Starting NOW, lasting days into weeks. Southern Ontario will have to be on ALERT as -10 Celsius is possible. Remember, water freezes at +32 degrees Fahrenheit or Zero degrees Celsius. the only thing that matters. What can really matter is how much WIND blows! Always check the WindChill! Human Skin can Freeze in 1min in the cold wind. People die from the WIND and COLD by the thousands every year in USA/Canada. A different model pushes COLD clear across to the East Coast! The JET STREAM (below) is Sucking the Arctic Air South like a vacuum cleaner. LOW Temperature records set to be Shattered! Serious Warning! of the United States. It then cuts across the entire USA before exiting East Coast. ICY ARCTIC COLD AIR straight down to TEXAS. LOOK OUT TEXAS, Alex Jones! The entire USA could be turned into a FREEZER by this Polar Vortex. Wednesday December 7, 2016. Keep the kids and pets home and inside too. Schools/work may close anyway. Stay indoors. Plan for power outages. hat, boots, thermal socks, long-johns. Check the Ratings! BE PREPARED!! YOU MUST READ OUR WEBSITE! This map may seem difficult to read at first. It is the Jet Stream. forms the letter “L” before winding up the East Coast. Very unusual. Frigid Air straight down to TEXAS. LOOK OUT TEXAS!! !, Alex Jones! 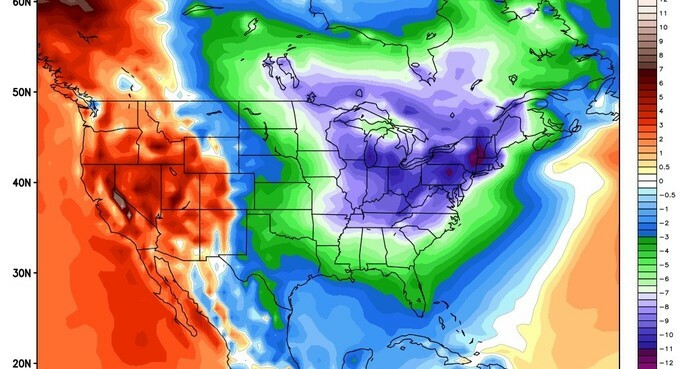 The entire USA could be turned into a FREEZER by this Polar Vortex. Brrrr! give them a bowl of hot soup. If only for a day or two. Thank you. Find wool blankets to use and to give out. Cover extremities. Do NOT get wet! Moisture can leech out body heat 10X faster! Hypothermia is Painful and Deadly. Keep Warm and Dry at all times! La Niña Affects Winter Across Canada and U.S.A. FACT of the Brand New N-S (North-South) Jet Stream!!! Old Weather Network Forecasting Models will not work. Watch Out! Keep Emergency water/food/heat, at all times. 2017 will be COLD! cold-kittycat. SC reminds all Pet owners to take special Care of Pets! Warning: STORMS Approaching East Coast of North America! Read down. History: SalvationCanada has been following NOAA and experts for decades. slowing down and the Earth’s magnetic field weakening!! This directly effected our protection against solar radiation!! This directly causes the POLAR VORTEX and Deep Freeze in Winter. However, a NEW event has just happened…..SOLAR VORTEX!!! SOLAR VORTEX: More Solar Radiation means heating of the Earth.! into the oceans which in turn decreases the salt content (salinity). This may sound insignificant, but in truth, is devastating. has slowed down and even stopped the ocean currents world wide! This means drastic Climate Change effecting every Country on Earth! Unforeseen was the change in the Jet Stream! 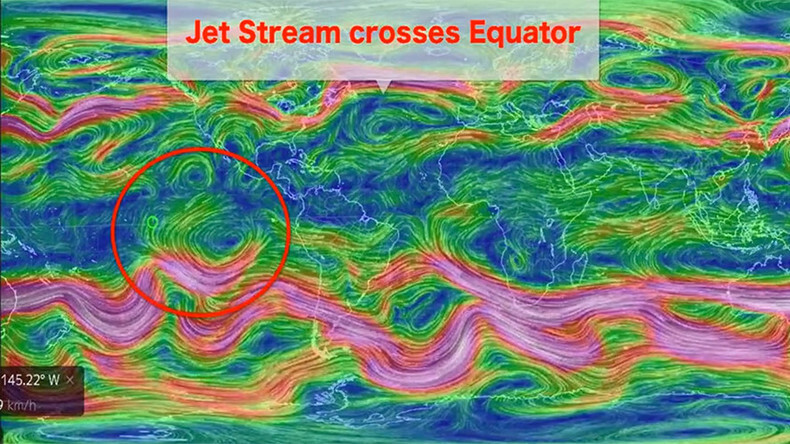 Jet Stream Crosses Equator!! Dramatic evidence of the Jet Stream gone crazy! What does this mean? Scientists are pulling their hair out at this NEW Jet Stream behavior. Never before seen, imagined, or plugged into climate models/forecast computers. Unknown is how extreme the weather will be because of the New Jet Stream. This could cause MASSIVE CROP FAILURES around the world. FAMINE IMMINENT! wiping out crops! Damaging roads/buildings/hospitals! Disrupting Power/Water! Tornadoes, Hurricanes, Lightening, Hail/Ice/Snow, Wind Storms, Damage, Death! Apocalypse!!! FAMINE! PESTILENCE! DEATH! WAR! Revelation 6:1-8. People will fight for their lives! Even kill neighbors for food or water!!! Warning! 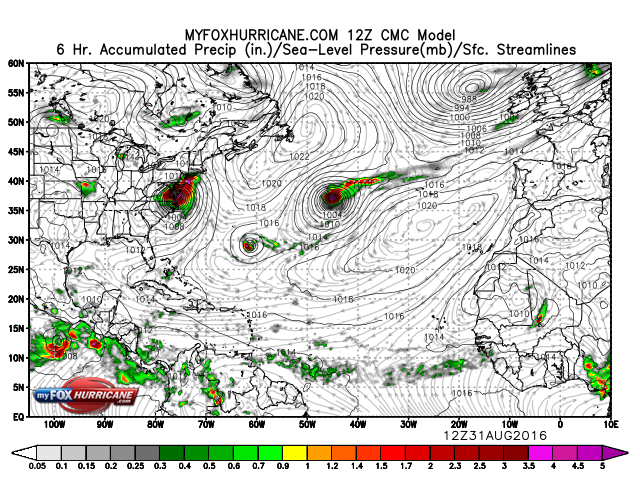 Multiple Hurricanes lining up to hit East Coast of North America!!! bringing yet again, cutting edge news that PROVES to be TRUE and ACCURATE! OK, This is now called (Reactors in Common). Wind Speed, Barometric Pressure. And thus a weather forecast. Sorta. Second, we now have “projections” and “computer modelling”. Better. Sorta. the jet stream. These add variable factors making forecasting very inaccurate. 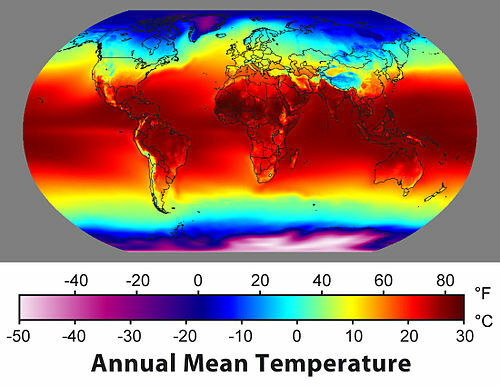 Fourth, Ocean temperatures, Ocean currents are fluctuating, affecting weather. Fifth, Salinity is decreasing due to Polar Ice Melts, increasing fluctuation. Sixth, Polar Vortex is causing a dramatic increase in severity of fluctuations. Seventh, Jet Stream has now gone North-South for first time in History! This has severe repercussions for weather events around the World! Tornadoes,lightening strikes, Huge Hail Storms, and more. Eight, Our Magnetic Shield is weakening, leaving 1/2 Radiation Shields – DOWN! This magnifies the Weather Anomalies and Disasters. The Poles are Reversing. SalvationCanada brought this story over a decade ago. or so. It convulses, twists, turns, u-turns, and goes back. This messes it all up. More@! The 2/2 shield is the ozone layer, which is missing at times – entirely. How many is that? A dozen at least. A dozen factors, which, if they converge, make the “Perfect Storm”. Watch for it. Coming Soon. The Perfect Storm. And when it happens, the Earth cannot contain it. Then what happens? To be continued…..When donations come in. Please Donate to SalvationCanada because we need a Professional website! Click on DONATE button above to give by PayPal or Credit Card. Are you prepared? Are you ready for this EMERGENCY? Can you SURVIVE? Become a member of SalvationCanada today! Donate by Bitcoin to help us! Thank YOU, and God Bless you with Wisdom to act on this Emergency NEWS. Warning: STORMS Approaching East Coast of North America! Be Prepared! Warning: THIS IS NOW!!! SEPTEMBER 2016 THE HURRICANES STRIKE!!! Winter 2015/2016, North America is under a Polar Vortex!!!! RECORD BREAKING FRIGID TEMPERATURES and WIND CHILLS! This is a SEVERE WEATHER ALERT OF IMMINENT DANGER! Many people are not prepared, not understanding the Danger. Just ONE minute in this extreme cold can freeze exposed flesh. Wear layers. Wear -60 C. outer wear. No skin anywhere exposed. One minute. Just ONE Minute can Freeze your flesh to death. want to lay down and sleep. Do this and you DIE. Beware!!! Listen to this Wise Warning. Do not go outside at all if preventable. Stay in and read your King James Bible. Practice Scripture. Pray for others. Tell God how much you Love Him. Count your blessings. retrievable if someone would kindly donate. Please Donate Today! -POLAR VORTEX ENDANGERS LIVES IN CANADA, and U.S.A.!!! -POLAR VORTEX DANGER! New Surge of Arctic -70 air grips North America! -POLAR VORTEX is HERE to Stay, bringing Long, Record LOW, Frigid Winters! -People are getting frostbite, hypothermia, losing fingers, limbs! -People are Freezing to Death across Canada and in the USA! Danger! READ MORE HERE, at SalvationCanada, to stay SAFE, stay ALIVE, help others! A POLAR VORTEX is a circular flow of wind around the North Pole. In Winter, this Wind whips around even faster, and much colder -70. This forms a POLAR VORTEX. 2013 and 2014 have both seen a rare meteorlogical event. a chunck of it broke off and whipped across Canada. Then it got stuck. (counter-clockwise) far down into the United States. Thus all of North America, except the coasts, set record low temperatures! POLAR VORTEX sits as a Very Strong Arctic Low Pressure, for weeks. POLAR VORTEX can reform in Arctic, and send another “chunck” our way! In 2014, ALL States, Provinces, in U.S.A. and Canada used 50% more heating! Gas and Oil Reserves were 50-100% depleted, forcing the purchase of higher priced fuel on the open market. Now, the cost to consumers is being applied for a 40% increase in the price of gas and oil per individual. OUCH!!! God has warned us about these times, and SalvationCanada has warned you! Numbness, prickling feeling, loss of sensitivity to touch. The affected area will also tingle or burn. Skin discoloration, hard or waxy-looking skin, is next. then pink or red, and finally white-purple (frozen). Frostbite can affect any part of the body, but extremities are vunerable. The tip of the nose, ears, cheeks, fingertips, fingers, toes, feet. Do not rub the skin. Do not touch the skin, or let skin touch anything. This will hurt, but is necessary to make a full recovery, if possible. Wrap in clean gauze. Seek medical care. Protect from cold as it will refreeze easily. Do not touch, consume, inhale, alcohol or tobacco. UNITED STATES ATTACKED BY POLAR VORTEX !!! MANY DEATHS! BILLIONS AND BILLIONS OF US DOLLARS IN DAMAGE AND LOSS!! EXTREME COLD AND BITTER WIND FREEZE NORTH AMERICA! Water pipes and water manes are BURSTING everywhere causing severe damage. Schools Closed, Businesses Closed, Airports Closed! Polar Vortex causes worse Freezing Tuesday in United States. Temperatures plummit across the United States of America Tuesday! into Extreme cold and Wind Chill into the -60’s. Yes, -60’s. Death happens easily from frostbite and hypothermia. People in Canada freeze to death every year, just waiting for the bus! Staff at Salvation Canada have had Hypothermia dozens of times. We urge people to spend extreme cold days inside, not at work or school. Spend the time productively Praying and reading the King James Bible. Phone up friends to check on them and pray with them. Hypothermia can happen at -1 Celcius, 30 Fahrenheit!! Seriously! So cover up any exposed skin, wear layers of clothing, and fleece. Wear a balaclava and wind proof cap – in canada, a “toque”. lol. Girl wears “toque” in summer in Winnipeg, Manitoba, Canada, standing in front of newly built “Human Rights Museum”. THOUSANDS of Homes are without water due to frozen pipes. THOUSANDS of waterlines will BURST and pour out water, when unthawed. THOUSANDS of angry people screaming at government, but nothing changes. ROADS are decimated by the Polar Vortex. Potholes everywhere! ROADS are like an exploded mine field! Very deep potholes too! ROADS are damaging vehicles. Tires blow, suspension breaks, and more! DAMAGED Homes, Property, Businesses, just about everything! DAMAGED Economy. Businesses closed, people cannot get to work. DAMAGED Finances. Cost of road clearing, salting, sanding, repairs, $$$. Over One Billion Dollars in costs and damages in 1 City, from Polar Vortex! What is the cost to ALL of North America, by Polar Vortex from Hell? Salvation Canada estimates OVER ONE TRILLION DOLLARS !!!!!! IN costs like gas, oil, extra snow removal, salting, sanding, and repairs. IN costs like damage to homes, vehicles, roads, equipment, persons (lawsuits). IN costs like downtime for working, school, businesses, government. How can our economy survive winters like these two? 2013, 2014?? Canada is Billions in debt. One Trillion including all debt. U.S.A. is Trillions in debt and is bankrupt. This makes it worse! If 2015 is another Polar Vortex, Much Loss, Much Suffering, Much Death! North America needs to come back to the REAL Jesus. Not the TV Jesus! North America Needs to REPENT of their overwhelming number of SINS! North America NEEDS to HUMBLE THEMSELVES, AND PRAY, AND SEEK THE LORD! will God *perhaps* Forgive their sins and heal their land. God WILL bring Judgement upon the SINNER! And when the sinner dies, they BURN in Hell, Forever, in Pain, and Screams! Are you walking free from all SIN, as outlined in the Bible? Don’t wait! Pray the Prayer Now! Death comes too soon for some! Don’t wait! Don’t go to the bar! Don’t spend your money on booze! That booze bar money is better used Donated to help the poor and needy. What is MOST IMPORTANT, IS YOUR PERSONAL SALVATION, and keeping it. Yes, like any gift, you can lose it. Yes, that means booze, cigarettes, drugs, gambling, fornication, ect. Such a small cost, for Eternal Life. Such a HUGE! cost, for Eternal Hell and Burning and Pain and Torment!! Will you open your heart, friends? Jesus, come into my heart. Forgive my sins. I repent of my sins. I promise to Love you, and obey you, Jesus. Teach me your ways. Contact us in membership tab email, if you have prayed this prayer. Read and Do the Salvation Tab, and all Tabs. Jesus Loves You, and so do we at Salvation Canada!